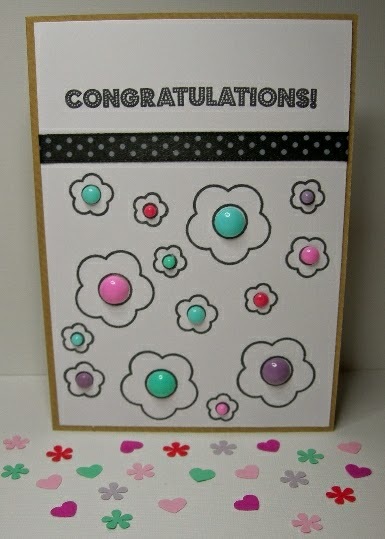 Sarah Hurley 365 (Formerly Sarah Hurley Challenges): 10 Minute Makes - Congratulations Card. Hello, it's Carol here today and I am going to share a super quick 10 Minute Make card with you. You may have seen Sarah announce that the amazing "A Few Of My Favourite Things" Kits are coming back! *happy dance* So I thought I would celebrate by making a card using a really cute set of flower stamps from one of the kits. Enamel Dots, ribbon and adhesives. Stamp lots of flowers on the blank piece of white card, leaving a gap at the top for the ribbon and sentiment. Attach the ribbon onto the card, leaving enough at either end to tuck under the stamped card. Pick a sentiment from the pack of Sentiments Stamps, I chose the "Congratulations" one, always a handy card to keep in your stash box. Now for the fun bit, add some colour, or you could leave it monochrome, the choice is up to you. I used some enamel dots to add a pop of colour. Thanks for popping by today, and I hope you are enjoying the "10 Minute Makes". Remember and pop by soon for some fabulous creations from my super talented teamies!